Organic pork cocktail sausages made at the Riverford butchery. Three things make our bangers brilliant: First, prime organic pork from West Country farms. Second, we don’t over-process them, so they stay coarse and meaty. Finally, we use natural casings that enhance the flavour. Wrap in streaky bacon and roast for pigs in blankets – a roast dinner must! 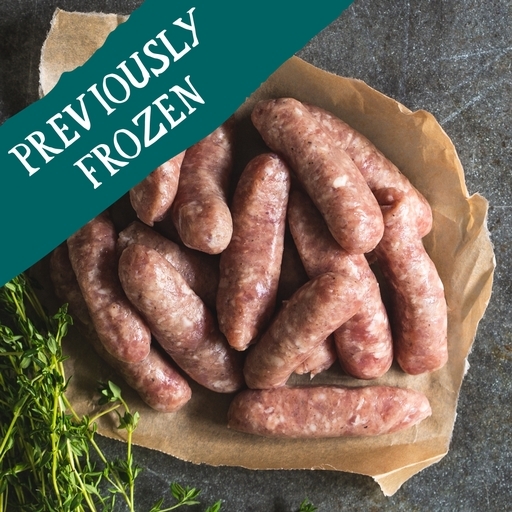 Our pork cocktail sausages have been previously frozen, so will not be suitable for home freezing. Cocktail sausages will be pre-frozen and cannot be frozen at home. Pork (89%), water*, seasoning (breadcrumbs (wheat flour, yeast*, salt*), potato starch, sea salt*, ascorbic acid E300*, white pepper, ginger, sage, sugar, nutmeg, black pepper, thyme, rosemary extract), natural sheep s casings*.